In our first JointHealth™ monthly of 2015, we are focusing on initiatives that help Canadian women better manage their health and improve their quality of life. Arthritis Consumer Experts (ACE) and its scientific partner, the Arthritis Research Centre of Canada (ARC), are pleased to be entering 2015 and the third year of our partnership with Shoppers Drug Mart/Pharmaprix. A partnership that has focused on women: mind, body and spirit. This is a reflection of arthritis’ status as a women’s disease. Of the more than 4.6 million Canadians diagnosed and living with arthritis, two out of three, or 2.8 million, are women. Pharmacists are a key member of a woman’s arthritis healthcare team. In January, Shoppers Drug Mart pharmacists will be able to share valuable arthritis information and detect or confirm arthritis with consumers through consumer education programs right at the pharmacy counter. Arthritis can strike a woman in the prime of her life, before or even during pregnancy, while succeeding in her work career or as an active senior. Our partnership with Shoppers Drug Mart/Pharmaprix continues to promote the importance of women’s health and calling attention to common arthritis symptoms, such as joint stiffness, swelling or inflammation, and the need to get screened early to help them assess their joint health and prevent or manage arthritis. To kick off the third year of our partnership with Shoppers Drug Mart/Pharmaprix, we want to draw your attention to the arthritis programs that will be launched in Shoppers Drug Mart/Pharmaprix locations in January as well as provide you insights and advice for Canadian women living with arthritis. This month, Shoppers Drug Mart/Pharmaprix is kicking off the New Year with a national campaign promoting arthritis awareness for women. The diagnosis of arthritis for a woman should not be taken lightly. Some autoimmune forms of arthritis are very serious and even life threatening. In partnership with Arthritis Consumer Experts and the Arthritis Research Centre of Canada, Shoppers Drug Mart/Pharmaprix has specifically designed tools for women to make arthritis health accessible and personalized either in-store or online. By recognizing arthritis symptoms and seeking an early, accurate diagnosis, most women are able to manage their pain and regain control of their lives. During January, Shoppers Drug Mart and Pharmaprix will encourage Canadian women living with arthritis to the screening tool and provide them with information on managing their pain and assessing their joint health. Through point-of-sale and flyer advertising, arthritis information brochure, social media channels, including Facebook and Twitter, and in-store national radio channel, Shoppers Drug Mart and Pharmaprix will reach a vast national audience to kick-start a dialogue with women living with arthritis. “For women experiencing symptoms, such as joint stiffness, swelling or inflammation, there’s a lot they can do to prevent the disease from worsening. From diet and exercise to medication management, a Shoppers Drug Mart pharmacist can provide practical tips and advice to help women detect and manage the disease early – an important step in delaying its effects and potential impact on other areas of her life, such as caring for her children, participating in the workforce, and enjoying everyday life,” says Jeannette Wang, SVP of Pharmacy Professional Affairs and Services for Shoppers Drug Mart. The Arthritis Screening tool is the first and only in-store and online program in Canada designed with women in mind. To help detect the disease at an early stage, the program includes a self-administered joint exam and questionnaire. By recognizing arthritis symptoms and seeking an early, accurate diagnosis, most women are able to manage their pain and regain control of their lives. A scientifically proven, high sensitivity questionnaire for pharmacists to identify early undiagnosed osteoarthritis of the knee as accurately as a M.R.I test. A scientifically tested, evidence-based pain medication review for all types of arthritis. A standardized letter for women to take to their family physician advising about their osteoarthritis of the knee screening and results of their medication review. The start of a new year is always a great time to think about making positive lifestyle changes. For a woman with a chronic disease like rheumatoid arthritis or osteoarthritis, New Year’s resolutions may seem harder to make and stick to over the long term. But some changes could make a big difference and help her better manage her arthritis. If a woman can make them part of her everyday life, these simple steps can be very effective in reducing joint pain and improve mobility, and they'll boost her overall health as a bonus. For example, if you have rheumatoid arthritis, knowing how to reduce inflammation can make you feel energized, not exhausted. And if you have osteoarthritis, learning exercises to strengthen core abdominal muscles could relieve pain in your back or hips. Do you have a New Year’s resolution to improve your quality of life living with arthritis? 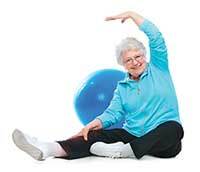 Exercise is especially important for women living with the joint pain and stiffness of arthritis. It may seem daunting at first, but in the long run exercise will help manage your symptoms and you will feel better. The Arthritis Research Centre of Canada (ARC) says that regular, moderate physical activity strengthens bones and muscles, decreases fatigue, and increases stamina and muscle flexibility. The kinds of exercises you can perform may vary depending on the severity and types of conditions you have. The most common form of arthritis, osteoarthritis, results from wear and tear on joints that accumulate over a lifetime. With osteoarthritis, injuries to the joints—whether through trauma or repetitive strain—lead to pain, stiffness, and eventually to inflammation. Many women think that because they have osteoarthritis they shouldn’t — or can't — exercise. But the opposite is true. Exercise is good for women with osteoarthritis because it strengthens the supporting tissues of the joint. Any kind of movement that puts a woman’s joints through their full range of motion eases stiffness and helps reduce arthritis symptoms. Exercise is also important for all joints and controlling your weight particularly benefits weight-bearing joints like knees, hips, and the back. A woman’s muscles that need to be strengthened will differ depending on which joints have arthritis. Check with your doctor about physical therapy to learn the specifics for your joint pain. Improving your diet and nutrition is one thing women can do to manage their arthritis that doesn’t require medication. Certain types of arthritis, such as osteoarthritis, may see more improvement than other forms due to diet and lifestyle changes, especially when the changes result in women reaching a healthy body weight and lowering the amount of pressure their joints are dealing with. 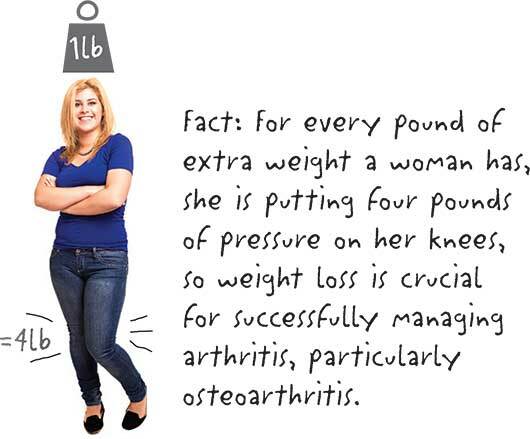 Losing weight also helps women with rheumatoid arthritis (RA) because it reduces pressure on affected joints. But here’s added motivation to shed pounds: Fat cells produce cytokines, proteins that increase inflammation. Belly fat is the most dangerous kind, because it’s especially likely to trigger inflammation that can worsen RA symptoms. Women who carry fat around the mid-section are also at a higher risk of having a heart attack – a threat women with RA are already at a higher risk of experiencing. Regardless of the arthritis type a woman lives with, she cannot go wrong by eating a healthy diet and in almost every case, exercising regularly. Unfortunately, there is no "magic arthritis diet" for a woman that can cure her arthritis, or eliminate arthritis symptoms. Unproven diets, or "miracle cures", are commonly found on the internet, and rumors abound about certain foods to eliminate or eat in excess. It is important to remember that few of these theories have ever been scientifically examined, and none have been scientifically proven effective. Though no dietary miracles have yet been discovered in the fight against arthritis, scientists have made a number of recent research advancements on the role of diet and nutrition in arthritis treatment. Today, we understand much more about the connections between arthritis, diet, healthy bodyweight, immune function, and inflammation. We are learning more and more about the positive steps women can take to fight arthritis and encourage overall health. Sleep’s key — if women are tired and not feeling well rested, they are going to be more likely to make poor health choices. All of the other positive lifestyle changes, like getting more exercise and eating a healthier diet, tend to go out the window when a woman gets run down, which will make arthritis pain worse. Studies on fibromyalgia have shown that women deprived of sleep can have increased pain. The bottom line on sleep is that you should feel rested when you wake up and not too drowsy throughout the day. Be sure to see your doctor if you think you might be having trouble sleeping. It might seem obvious to some, but many women want to be independent and may even resist asking for assistance. Instead, you should get help with physical tasks and pace yourself in general. Most women will have good days and bad days. When you have a good day, don’t feel like you have to do everything. Next time the grocer offers to help you with your bags, for instance, show him to your car. Those moments of rest can prevent hours of arthritis pain later on. Not every woman can prevent stress effectively — it’s a part of all of our lives. The key for women is learning how to deal with it. Look for positive outlets for stress like prayer, meditation, or yoga. It’s important because stress has many negative effects, like decreasing the amount and quality of the sleep you get. Stress can aggravate pain and make you less likely to do healthful things to maintain a good lifestyle. Use social time, like having lunch with friends, or solo meditation, to lower your stress and minimize the impact that arthritis has on your life. If you have arthritis, you may be among those women (and there are many) who feel that their arthritis pain is influenced by the weather—specifically, that they experience more arthritis pain on cold, wet days and less on warm, dry days. Women, whose arthritis seems to flare before or after it rains, often wonder if damp weather is making their arthritis worse. Researchers at the Arthritis Research Centre of Canada (ARC) say they get this question a lot, even though there is no scientific evidence supporting a link between stiff, painful joints and cold, damp weather. Although some evidence exists that people living in warmer, drier climates experience fewer episodes of arthritis pain, climate does not affect the biologic course of the disease. At most, according to ARC researchers, it may affect symptoms of arthritis pain. One theory holds that a drop in air pressure (which often accompanies cold, rainy weather) allows tissues in the body to expand to fill the space, meaning that already inflamed tissue can swell even more and cause increased arthritis pain. Other possibilities: Pain thresholds drop in colder weather; cold, rainy days affect mood; and during colder weather people are less likely to be outside and get the exercise that normally helps keep arthritis pain in check. With the more prevalent arthritis types like osteoarthritis or rheumatoid arthritis, sun exposure, because it provides warmth, can make you feel better. There's no evidence that it actually changes the condition but women living with arthritis do report a “sun vacation” affects them symptomatically in a positive way. In spite of the cold Canadian weather conditions, women living with arthritis need to maintain an active lifestyle and keep moving. Exercise fights arthritis-related stiffness and discomfort by strengthening muscles around joints and keeping them aligned. Go out for a brisk walk, hike or bike ride (assuming paths are clear of ice and snow). Even a daily 30-minute walk around your neighbourhood will help you maintain joint function and general wellness. And don’t worry that frigid temperatures will worsen pain. Cold won’t harm joints as long as you appropriately prepare them before and after exercising, dress warmly in layers and wear shoes with good traction to prevent falling on slippery surfaces. Warm gloves or mittens and socks will also keep extremities toasty. Warming up before exercising is a good idea for everyone, but is particularly important if you are a woman living with arthritis. Vigorous exercise without a proper warm up can make joint pain worse. Start your exercise routine with stretching and range of motion exercises before moving on to strengthening or aerobic activities. Applying a heating pad or hot pack to your joints or taking a warm shower or bath before exercising can help loosen your muscles and joints. When you begin exercising, use gentle movements to avoid stressing stiff joints, and gradually increase the intensity of your movements as your joints relax. Even if cold, wet weather means you can’t spend time outdoors, you can still get valuable exercise at home, in a gym or heated pool. Researchers at the Arthritis Research Centre of Canada report that water provides an excellent medium for indoor exercising. The buoyancy of your body in water means less weight on the main weight-bearing joints, (feet, ankles, knees, and hips) to allow for freer, less painful movement while still providing resistance to muscles. Simply walking through the water in a swimming pool protects joints and lessens possible pain, while providing a workout with 12 times the resistance of walking on land. If you haven’t begun to practice yoga, the winter is a great time to start. Having arthritis should not prevent women from trying yoga as an alternative to traditional exercise. However, for many, yoga in particular, may bring to mind pretzel-like poses requiring considerable strength and balance. Over the past 12 months, ACE received unrestricted grants-in-aid from: AbbVie Corporation, Amgen Canada, Arthritis Research Centre of Canada, BIOTECanada, Bristol-Myers Squibb Canada, Canadian Institutes of Health Research, the Canadian Rheumatology Research Consortium, Celgene Inc., GlaxoSmithKline, Hoffman-La Roche Canada Ltd., Janssen Inc., Pfizer Canada, Purdue Pharma L.P., Sanofi Canada, St. Paul’s Hospital (Vancouver) and the University of British Columbia. ACE also receives unsolicited donations from its community members (people with arthritis) across Canada. ACE thanks these private and public organizations and individuals.